As a blogger, I’ve written about the comical world of stock photography on multiple occasions. First there were the 25 things stock photography taught us about love, followed by the 18 valuable lessons stock photography taught us about parenting, and let us never forget the 18 pictures of people having a more magical holiday than you. 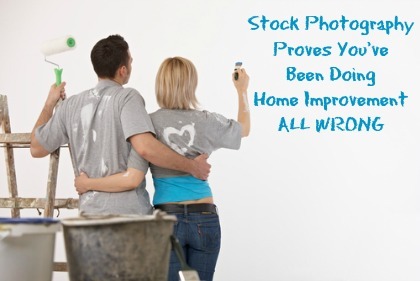 But for all of stock photography’s ridiculousness, there’s bona fide wisdom to be gained when it comes to home improvement for couples. So I guess this means my husband and I have been doing-it-ourselves all wrong, and if you’ve ever wondered if your partner’s blood might serve as a lovely accent color on a challenging design project, you’ve been doing it wrong too.